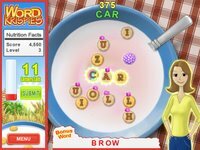 Word Krispies is the second offering from Liquid Dragon Studios, this time ditching the action element found in Odyssey: Winds of Athena and favoring word games and brain teasers instead. Cereals with alphabets are added into a bowl of milk periodically, and it's up to the player to form the best words and earn extra points for their efforts. Letters will disappear if left unused, leading to the loss of a turn. Nothing as fancy as their previous release but works well enough to entertain wordsmiths for an afternoon or two.